T cell-mediated adaptive immunity is required to help clear infection with the facultative intracellular bacterial pathogen Salmonella enterica serovar Typhimurium (S. Typhimurium), yet development of T cell-mediated adaptive immunity to S. Typhimurium has been described as slow and inefficient. A key step in inducing T cell-mediated adaptive immunity is T cell priming; the activation, proliferation, and differentiation of naive T cells following initial encounter with Ag. We previously demonstrated that S. Typhimurium had a direct inhibitory effect on naive T cells from mouse, blocking their proliferation. In this study, we show that S. Typhimurium down-modulates expression of the TCR β-chain, a molecule that is essential for Ag recognition and T cell function. Specifically, we demonstrate that reduced amounts of surface and intracellular TCR-β protein and decreased levels of tcrβ transcript are expressed by T cells cultured in the presence of S. Typhimurium. We further show that the down-modulation of TCR-β expression requires contact between S. Typhimurium and the T cells and that once contact occurs, a factor capable of reducing TCR-β expression is secreted. These results provide new insight into the mechanism by which S. Typhimurium may inhibit T cell priming and avoid clearance by the adaptive immune system. Inflammatory cells of the innate immune system, such as macrophages and neutrophils, provide a first line of defense against pathogenic microorganisms (1, 2, 3). However, ultimate clearance of microbial pathogens often requires lymphocytes of the adaptive immune system (4, 5, 6). During infection with many microbial pathogens, T cells are a key lymphocyte subset for eliminating infection (4, 5, 6). A crucial step in inducing a T cell response is T cell priming; the activation, proliferation, and differentiation of naive T cells following their initial encounter with Ag displayed on the surface of professional APCs such as dendritic cells (7, 8, 9, 10, 11). As T cells proliferate and differentiate into effector T cells, they can acquire the ability to lyse infected cells or secrete cytokines that help resolve infection (5). What is understood about T cell responses to microbial pathogens is largely based on work done using model pathogens such as Listeria monocytogenes and lymphocytic choriomeningitis virus (6, 12, 13, 14, 15, 16, 17). However, as investigators have explored T cell responses to other microbial pathogens, it has become clear that these T cell responses can differ greatly from those seen following infection with model pathogens. In particular, a number of microbial pathogens evade or alter T cell-mediated adaptive immunity by avoiding T cell recognition or by interfering with T cell priming (18, 19, 20, 21, 22). T cells are important in adaptive immunity to the facultative intracellular bacterial pathogen Salmonella enterica serovar Typhimurium (S. Typhimurium),4 yet development of T cell-mediated adaptive immunity to S. Typhimurium has been described as slow and inefficient (23, 24). We explored why development of T cell-mediated adaptive immunity to S. Typhimurium is slow and inefficient, and whether S. Typhimurium play an active role in inhibiting development of protective immunity. We previously showed that T cells failed to proliferate in response to Ag-laden dendritic cells when S. Typhimurium were present (25). Dendritic cells are the most important professional APCs and are a central link between the innate and adaptive immune system (7, 8, 9). We found that S. Typhimurium killed dendritic cells (26), preventing presentation of Ag to T cells. However, when we used mutant S. Typhimurium that could not kill dendritic cells, we found that the T cells remained unable to proliferate (25). These results led us to conclude that although dendritic cell killing may contribute to the lack of T cell proliferation, dendritic cell killing alone was not responsible for the lack of T cell proliferation. We further showed that, even in the absence of dendritic cells, S. Typhimurium had an inhibitory effect on T cells, blocking their proliferation (25). In this study, we further characterize this direct inhibitory effect of S. Typhimurium on T cells. We show that S. Typhimurium down-modulate expression of the β-chain of the TCR, TCR-β, a molecule that is indispensable for Ag recognition and T cell function (27). Bacteria were grown under aerobic conditions at 37°C in 3 ml of Luria-Bertani broth (Difco). Heat-killed bacteria were obtained by incubating bacterial suspensions at 65°C for 20 min. Escherichia coli DH5α, wild-type S. Typhimurium (14028; American Type Culture Collection), an isogenic virulence plasmid-cured (a derivative of American Type Culture Collection 14028), and a set of isogenic invA, spiB, phoP, and constitutively expressing phoP mutant strains were published previously (25). S. Typhimurium-deficient for sti were provided by J. Mekalanos (Harvard Medical School, Boston, MA). C57BL/6J mice and congenic mice deficient for NO synthase-2 or IL-10 were purchased from The Jackson Laboratory and were used at ∼8–10 wk of age. R. Flavell (Yale University, New Haven, CT) provided mice transgenic for a dominant negative form of TGF-βRII (28). All mice were housed and used in accordance with Institutional Animal Care and Use Committee guidelines. CD90.2-conjugated MACS microbeads and magnetic separation columns (Miltenyi Biotec) were used for enrichment of T cells from mouse spleens. T cells were then resuspended in RP-10 (RPMI 1640 medium (Invitrogen Life Technologies) supplemented with 10% FCS (Invitrogen Life Technologies), l-glutamine, HEPES, and 50 μM 2-ME) and seeded at 1 × 105 cells per well (96-well format) in wells coated with 5 μg/ml anti-CD3ε (BD Pharmingen), except where noted. T cells were then cultured at 37°C/5% CO2 in the presence of bacteria for 2 h at a multiplicity of infection of 30 to 50, washed once, and resuspended in RP-10 supplemented with 2% penicillin/streptomycin and 50 μg/ml gentamicin to kill all the remaining bacteria. After ∼20 h of culture in the presence of antibiotics, the T cells were stained and analyzed by flow cytometry. To block PGE2 production, the T cells were cultured in the presence of 1 μM indomethacin (an inhibitor of both cyclooxygenase-1 and -2; Cayman Chemicals) as previously described (29, 30). Where noted, a Transwell with 0.4-μm pore polycarbonate membrane insert (Corning Life Sciences; Costar) was used to separate S. Typhimurium from the T cells, and a polyethersulfone membrane with 0.2-μm pore (Nalgene) was used to obtain T cell culture supernatant. Heat-treated supernatant was prepared by incubating a 150-μl aliquot of filtered supernatant at 80°C for 10 min. Trypsin-treated supernatant was prepared by incubating a 150-μl aliquot of filtered supernatant with 2 μl of trypsin (1 mg/ml; Sigma-Aldrich) for 5 min at 37°C. Soybean trypsin inhibitor (Sigma-Aldrich) was then added in 10-fold excess to inactivate the trypsin. To detect TCR-β surface expression, the T cells were stained with allophycocyanin-conjugated anti-CD90.2 (clone 53-2.1), PE-conjugated anti-CD25 (clone PC61), and FITC-conjugated anti-TCR-β (clone H57-597) in the presence of Fc block (clone 2.4G2). To detect intracellular TCR-β expression, the T cells were stained for surface TCR-β as we described and fixed using Cytofix. One-half of the total number of cells was then permeabilized with Cytoperm, whereas the other half was left untreated, and both samples were then stained again with FITC-conjugated anti-TCR-β in the presence of Fc block. Intracellular TCR-β expression by CD25+CD90.2+ T cells was calculated by subtracting the level of surface TCR-β expression from the total level of TCR-β expression (geometric mean fluorescence intensity). To detect intracellular production of IFN-γ at 3 days poststimulation, GolgiPlug was added to the T cell cultures at 1/500 for the final 6 h of incubation, after which the T cells were stained with allophycocyanin-conjugated anti-CD90.2 in the presence of Fc block, fixed and permeabilized with Cytofix/Cytoperm, and then stained with PE-conjugated anti-IFN-γ (clone XMG1.2) in the presence of Fc block. To measure viability, the T cells were stained with FITC-conjugated annexin V and propidium iodide. To measure T cell activation, the T cells were stained with allophycocyanin-conjugated anti-CD90.2 (clone 53-2.1) and PE-conjugated anti-CD69 (clone H1.2F3), PE-conjugated anti-CD25 (clone PC61), PE-conjugated anti-CD44 (clone IM7), or PE-conjugated anti-CD62 ligand (clone MEL-14). All reagents were purchased from BD Pharmingen. Data were acquired on a FACSCalibur flow cytometer (BD Biosciences), and cells were analyzed using CellQuest Pro software (BD Biosciences). Total RNA was isolated from T cells using the TRIzol reagent (Invitrogen Life Technologies). Samples were then subjected to real-time RT-PCR on an ABI 7000 Sequence Detection System (Applied Biosystems) using the QuantiTect SYBR Green RT-PCR kit from Qiagen. Expression of tcrβ was detected using forward primer 5′-GCACAATCCTCGAAACCACT-3′ and reverse primer 5′-GGCCTCTGCACTGATGTTCT-3′. Expression of tcrβ transcript was normalized against Rpl19 expression using forward primer 5′-ATCCGCAAGCCTGTGACTGT-3′ and reverse primer 5′-TCGG GCCAGGGTGTTTTT-3′. A paired Student’s t test was used to determine statistical significance. Values of p ≤ 0.05 were considered statistically significant. We previously showed that naive T cells cultured in the presence of S. Typhimurium failed to blast and proliferate in response to direct TCR ligation (25). To determine whether this failure prevented their differentiation into armed effector cells, we tested whether these T cells produced IFN-γ, a cytokine required to control and clear S. Typhimurium infection (31, 32, 33, 34, 35, 36). We found that T cells cultured in the presence of S. Typhimurium produced significantly less IFN-γ than uninfected T cells (Fig. 1⇓A). These results indicate that T cells cultured in the presence of S. Typhimurium not only failed to blast and proliferate, but also failed to differentiate and acquire effector functions. S. Typhimurium inhibit T cells by targeting steps downstream of T cell activation. A, Production of IFN-γ by T cells cultured in the absence (UI) or presence of S. Typhimurium was measured by intracellular cytokine staining. B, Viability of T cells cultured in the absence (UI) or presence of S. Typhimurium was measured over time using annexin V and propidium iodide staining. C, Anti-CD3ε-induced activation of T cells cultured in the absence (UI) or presence of S. Typhimurium was measured by staining for T cell activation markers CD69, CD25, CD44, and CD62 ligand. Data are representative of at least three independent experiments. To determine whether S. Typhimurium were killing the T cells, we labeled T cells with annexin V and propidium iodide. When measured over time, annexin V and propidium iodide can be used to evaluate cell viability. Annexin V specifically binds to phosphatidylserine, a plasma membrane lipid that rapidly relocalizes from the inner to the outer leaflet of the plasma membrane in cells that are undergoing programmed cell death, whereas propidium iodide, a DNA intercalator, is excluded from cells with an intact plasma membrane. We found that the viability of T cells cultured in the presence of S. Typhimurium was comparable to the viability of uninfected T cells (Fig. 1⇑B), indicating that S. Typhimurium were not killing the T cells. We next examined whether S. Typhimurium prevented T cell activation, a prerequisite for T cell proliferation and differentiation. As shown in Fig. 1⇑C, T cells cultured in the presence of S. Typhimurium up-regulated expression of early activation markers CD69, CD25, and CD44 and down-regulated expression of CD62 ligand (Fig. 1⇑C), indicating that signaling pathways involved in T cell activation remained intact. Therefore, inhibition of T cells by S. Typhimurium appears to occur somewhere after the T cells have become activated. As we began to examine where in the pathway from TCR engagement to T cell proliferation and differentiation S. Typhimurium were acting, we found that S. Typhimurium down-modulated expression of the β-chain of the TCR itself (Fig. 2⇓A). The TCR relays information about the quantity and quality of Ag to the intracellular signal transduction machinery, which is the first step in T cell clonal expansion (27, 37). We observed no reduction in TCR-β surface expression when T cells were cultured in the presence of heat-killed S. Typhimurium or E. coli (Fig. 2⇓A), suggesting that TCR-β down-modulation requires live bacteria and is S. Typhimurium-specific. Moreover, no reduction in TCR-β surface expression was observed when we used resting T cells instead of stimulated T cells (Fig. 2⇓B), suggesting that S. Typhimurium specifically affect activated T cells. S. Typhimurium down-modulate TCR-β expression. A, Anti-CD3ε-stimulated T cells, left uninfected (UI) or cultured in the presence of live S. Typhimurium, heat-killed S. Typhimurium, or E. coli were stained with anti-TCR-β and anti-CD25. Intracellular TCR-β expression was calculated as the geometric mean fluorescence intensity (GMFI). B, Resting T cells, cultured in the absence (UI) or presence of S. Typhimurium, were stained with anti-TCR-β and anti-CD25. C, Anti-CD3ε-stimulated T cells, cultured in the absence or presence of S. Typhimurium, were stained with anti-TCR-β and anti-CD25, and fixed using Cytofix. One half of the total number of cells was permeabilized with Cytoperm, whereas the other half was left untreated, and both samples were restained with anti-TCR-β. Intracellular expression of TCR-β by CD25+ T cells was calculated by subtracting the level of TCR-β surface expression from the total level of TCR-β expression (GMFI). D, Total RNA was extracted from anti-CD3ε-stimulated T cells cultured in the absence or presence of S. Typhimurium, and relative expression of tcrβ transcript was determined using quantitative real-time RT-PCR. Data are arithmetic means (A, C, and D) or representative (B) of at least three independent experiments. Error bars indicate the SD of the mean. The p values shown (*) indicate statistical significance. We next focused on three mechanisms by which S. Typhimurium-induced TCR-β down-modulation could occur: increased TCR-β retention, enhanced TCR-β degradation, or diminished de novo TCR-β biosynthesis (38, 39). As a starting point to distinguish between these three mechanisms, we examined intracellular TCR-β expression by T cells cultured in the presence or absence of S. Typhimurium. As shown in Fig. 2⇑C, we found no evidence to suggest that S. Typhimurium down-modulated TCR-β surface expression by increasing TCR-β retention. 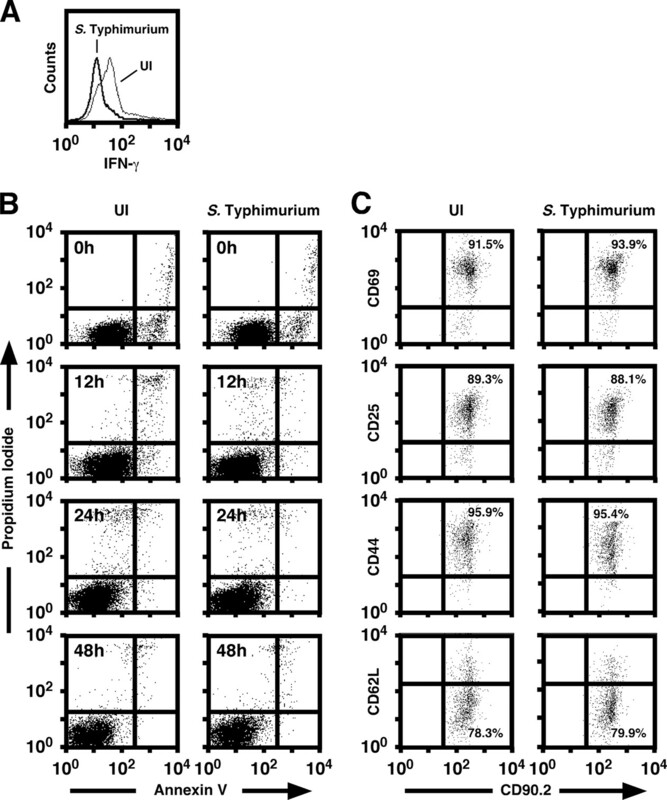 We found instead that T cells cultured in the presence of S. Typhimurium expressed reduced levels of intracellular TCR-β when compared with uninfected T cells (Fig. 2⇑C). These results suggest that S. Typhimurium down-modulate TCR-β surface expression either by enhancing TCR-β degradation or by diminishing de novo TCR-β biosynthesis. We next used quantitative real-time RT-PCR to analyze expression of tcrβ RNA by T cells cultured in the presence or absence of S. Typhimurium. As shown in Fig. 2⇑D, we found that T cells cultured in the presence of S. Typhimurium expressed significantly less tcrβ RNA than uninfected T cells (Fig. 2⇑D). These results demonstrate that S. Typhimurium down-modulate TCR-β expression, at least in part, by reducing tcrβ transcript levels. We next sought to determine whether contact between S. Typhimurium and T cells was required for the down-modulation of TCR-β expression. Therefore, we separated S. Typhimurium from the T cells using a 0.4-μm filter that prevented contact, but allowed medium to flow freely between both compartments. Under these conditions, the T cells expressed normal levels of TCR-β on their surface (Fig. 3⇓A), demonstrating that contact was required for the down-modulation of TCR-β expression by S. Typhimurium. 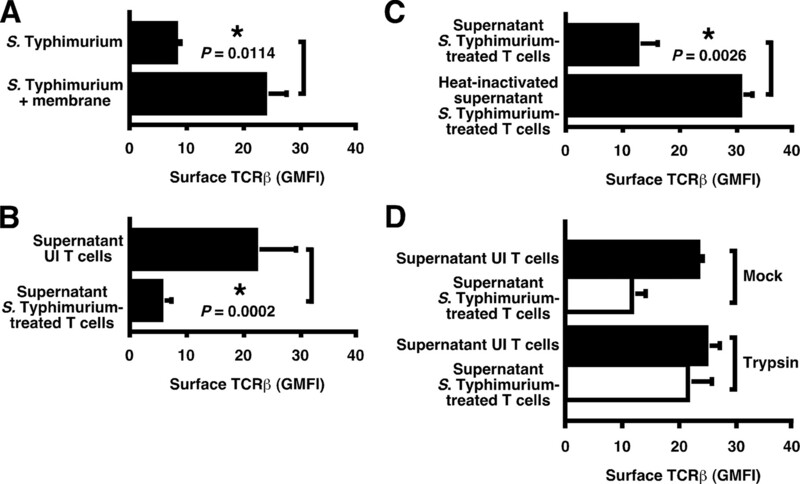 Furthermore, we found that when the supernatant from cultures in which S. Typhimurium were allowed to contact T cells was added to freshly isolated T cells, these T cells then also expressed reduced levels of TCR-β on their surface (Fig. 3⇓B). Therefore, it appears that contact between S. Typhimurium and T cells induces secretion of a T cell inhibitor capable of down-modulating TCR-β expression. A heat-labile and protease-sensitive factor capable of down-modulating TCR-β expression is secreted into the medium when S. Typhimurium contact T cells. A, Anti-CD3ε-stimulated T cells, cultured in the presence of S. Typhimurium under conditions that allowed contact (top) or prevented contact (bottom), were stained with anti-TCR-β and anti-CD25. B, Anti-CD3ε-stimulated T cells, treated with supernatant from uninfected (UI) T cells or supernatant from T cells cultured in the presence of S. Typhimurium (under conditions that allowed contact), were stained with anti-TCR-β and anti-CD25. C, Anti-CD3ε-stimulated T cells, incubated with untreated or heat-treated supernatant from T cells cultured in the presence of S. Typhimurium (under conditions that allowed contact), were stained with anti-TCR-β and anti-CD25. D, Anti-CD3ε-stimulated T cells, incubated with mock-treated or trypsin-treated supernatant from T cells cultured in the absence or presence of S. Typhimurium, were stained with anti-TCR-β and anti-CD25. Data are arithmetic means of at least three independent experiments. Error bars indicate the SD of the mean. The p values shown (*) indicate statistical significance. S. Typhimurium-induced secretion of PGE2 and NO by phagocytes can cause T cell immunosuppression (40, 41). To determine whether PGE2 or NO was required for S. Typhimurium-induced TCR-β down-modulation, we cultured T cells treated with indomethacin, which blocks PGE2 production, and T cells from mice deficient for NO synthase-2 in the presence of S. Typhimurium. We found that neither indomethacin treatment nor NO synthase-2 deficiency had any effect on TCR-β expression by T cells cultured in the presence of S. Typhimurium (data not shown), providing evidence that the down-modulation of TCR-β expression by S. Typhimurium does not require PGE2 or NO. To determine whether the secreted factor responsible for TCR-β down-modulation was a protein, we heat- or trypsin-treated the supernatant from cultures in which S. Typhimurium were allowed to contact T cells. We found that both heat and trypsin treatment destroyed the inhibitory activity of the supernatant (Fig. 3⇑, C and D), suggesting that the secreted factor responsible for TCR-β down-modulation likely is a protein. Candidate proteins that are known to cause T cell immunosuppression include cytokines such as IL-10 and TGF-β (42, 43). To determine whether IL-10 or TGF-β signaling was required for the down-modulation of TCR-β by S. Typhimurium, we cultured and tested T cells from mice deficient for IL-10 or transgenic for a dominant negative form of TGF-βRII, where cells are not able to respond to TGFβ. We found that IL-10-deficient T cells, T cells from a dominant negative form of TGFβRII, and wild-type T cells expressed comparable levels of surface TCR-β when cultured in the presence of S. Typhimurium (data not shown). These results indicate that the down-modulation of TCR-β expression by S. Typhimurium does not require IL-10 or TGF-β signaling. As we established that reduced TCR-β levels were expressed by T cells cultured in the presence of S. Typhimurium, but not by T cells cultured in the presence of E. coli (Fig. 2⇑A), we initiated experiments to identify the S. Typhimurium genes required for TCR-β down-modulation. Because TCR-β down-modulation required contact between S. Typhimurium and the T cells, we tested whether S. Typhimurium used a contact-dependent type three secretion system (TTSS) (44, 45) to down-modulate TCR-β expression. We first tested S. Typhimurium mutants deficient for invA or spiB. These genes code for essential structural components of the Salmonella pathogenicity island (SPI)1- and SPI2-encoded TTSS, respectively. These secretion systems are used by S. Typhimurium to inject bacterial effector proteins into the cytoplasm of host cells (46, 47, 48, 49). Mutants deficient for invA, spiB, or both invA and spiB, like wild-type S. Typhimurium, down-modulated TCR-β expression (Fig. 4⇓), suggesting that neither of the TTSSs encoded by S. Typhimurium was required for T cell inhibition. TCR-β down-modulation requires neither of the contact-dependent TTSSs encoded by S. Typhimurium, nor does it require phoP, sti, or the virulence plasmid. Anti-CD3ε-stimulated T cells, left uninfected (UI) or cultured in the presence of wild-type (WT) S. Typhimurium mutated for invA (SPI1 TTSS), spiB (SPI2 TTSS), invA and spiB (SPI1 and SPI2 TTSS), phoP, or sti, or S. Typhimurium cured of the virulence plasmid, were stained with anti-TCR-β and anti-CD25. Data are arithmetic geometric mean fluorescence intensity (GMFI) of at least three independent experiments. Error bars indicate the SD of the mean. The p value shown (∗) indicates statistical significance. Similar results were obtained when we tested S. Typhimurium strains deficient for phoP or constitutively expressing phoP (Fig. 4⇑). Although the phoP gene product has been shown to regulate expression of numerous virulence genes in S. Typhimurium (50, 51, 52), our data indicate that the phoP gene is not required for the down-modulation of TCR-β expression by S. Typhimurium. Lastly, we found that S. Typhimurium strains lacking the virulence plasmid or a functional sti gene, like wild-type S. Typhimurium, down-modulated TCR-β expression (Fig. 4⇑). The virulence plasmid has been shown to cause immunosuppression in mice (53) and purified Sti protein has been reported to have an immunosuppressive effect on T cells (54). 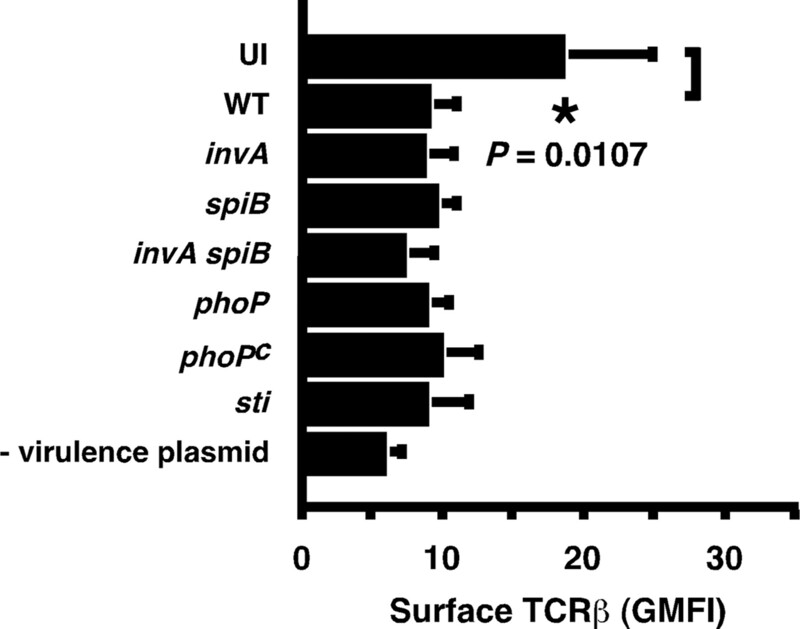 Our results indicate that neither the virulence plasmid nor a functional sti gene is required for the down-modulation of TCR-β expression by S. Typhimurium. Because the mutants tested in this study lack functional copies of genes that control expression or secretion of a large number of S. Typhimurium effectors, these results suggest that other, yet unknown genes are responsible for the down-modulation of TCR-β expression by S. Typhimurium. Microbial pathogens must avoid clearance by the immune system to replicate within mammalian hosts. To avoid clearance, many microbial pathogens combat, exploit, or evade host defenses, subverting the immune system. Examples of microbial immune subversion include blocking of Ab effector function (55) or secretion of toxins that target the immune system (56, 57). Other microbial pathogens block phagocytosis (58, 59, 60), avoiding the killing activity of professional phagocytes, or kill professional APCs (61, 62, 63), preventing induction of adaptive immunity. A number of microbial pathogens survive and multiply inside host cells (22, 64, 65), evading the effects of Abs and complement-mediated killing. These pathogens must overcome intracellular killing mechanisms to replicate intracellularly (22). Another mechanism pathogens use to hide from adaptive immunity is to alter Ag processing and presentation to T cells (18, 19), avoiding recognition by the adaptive immune system. In this study, we provide an example of a bacterium subverting the immune system by directly targeting T cell function. Previously, we cultured S. Typhimurium with T cells and showed that the presence of S. Typhimurium prevented T cell proliferation (25). This inhibition was observed with both CD4+ and CD8+ T cells and required live bacteria (25). To further dissect how S. Typhimurium blocked proliferation of T cells, we began to examine the cascades involved in T cell clonal expansion. The first step in T cell clonal expansion is engagement of the TCR by Ag. The TCR relays information about the quantity and quality of Ag to the intracellular signal transduction machinery and is an integral part of the immunological synapse, formation of which is required for optimal costimulation and T cell priming (27, 37, 66). In this study, we show that S. Typhimurium down-modulate expression of the TCR β-chain, thus targeting the first step in T cell clonal expansion. We further demonstrate that this reduction in TCR-β expression corresponds to a reduction in tcrβ transcript levels, suggesting that S. Typhimurium inhibit de novo TCR-β synthesis. Although the down-modulation of TCR-β expression may contribute to S. Typhimurium-induced inhibition of T cells, there are very possibly other points downstream in the T cell signaling cascades that also may be targeted for disruption by S. Typhimurium. We show that the down-modulation of TCR-β expression requires direct contact between S. Typhimurium and the T cells, and that, once contact occurs, a factor capable of down-modulating TCR-β expression is secreted into the medium. We further show that this secreted factor is heat-labile and protease sensitive, suggesting that it is a protein. We are working to identify this factor and ascertain whether the inhibitor is secreted by S. Typhimurium or by the T cells. Because contact was required for inhibitor secretion, it seemed unlikely that S. Typhimurium simply released the inhibitor into the medium. Rather, our results suggested that perhaps S. Typhimurium used a contact-dependent TTSS to secrete the inhibitor into the medium, but neither of the TTSSs encoded by S. Typhimurium was required for T cell inhibition. These results led us to consider whether the inhibitor might be secreted into the medium by the T cells instead of by the bacteria. In our experiments, T cells were cultured in the presence of S. Typhimurium for 2 h under conditions that allowed contact. The culture supernatant was then replaced with medium containing antibiotics, killing all the remaining bacteria. We next incubated the culture overnight in the presence of antibiotics, and filtered the culture medium to remove the bacteria and T cells. This was the source of the factor we used to demonstrate that a factor capable of down-modulating TCR-β expression was secreted into the medium when S. Typhimurium contacted T cells. Based on these experiments, it seems unlikely that S. Typhimurium secrete the inhibitor. Rather, it seems more plausible that S. Typhimurium serve as a ligand, inducing inhibitor secretion by the T cells. Candidate inhibitors that might be secreted by T cells to down-modulate or suppress immune responses include cytokines such as IL-10 and TGF-β (42, 43). However, in this study we show that neither IL-10 nor TGF-β signaling is required for the down-modulation of TCR-β expression by S. Typhimurium. In conclusion, our findings show an additional effect of S. Typhimurium on the host that may inhibit T cell priming following infection and tilt the balance between immune clearance and pathogen replication in favor of S. Typhimurium. Our findings provide new insight into the intricate interactions between S. Typhimurium and its host and may reveal how microbial pathogens like S. Typhimurium have evolved to overcome host defense mechanisms. We thank members of our laboratory for stimulating discussions and constructive comments on the manuscript. ↵1 This work was supported in part by Grant AI055962 from the National Institutes of Health (to M.N.S.). A.W.M.v.d.V. was supported in part by Grant P30 DK34845 from the Harvard Digestive Diseases Center, National Institutes of Health. ↵2 Current address: Department of Molecular Genetics and Microbiology, and Center for Infectious Diseases, 130 Life Sciences Building, State University of New York, Stony Brook, NY 11794. ↵4 Abbreviations used in this paper: S. Typhimurium, Salmonella enterica serovar Typhimurium; TTSS, type three secretion system; SPI, Salmonella pathogenicity island. Rescigno, M.. 2002. Dendritic cells and the complexity of microbial infection. Trends Microbiol. 10: 425-461. Rescigno, M., P. Borrow. 2001. The host-pathogen interaction: new themes from dendritic cell biology. Cell 106: 267-270. Appelberg, R.. 2007. Neutrophils and intracellular pathogens: beyond phagocytosis and killing. Trends Microbiol. 15: 87-92. Kaufmann, S. H.. 1993. Immunity to intracellular bacteria. Annu. Rev. Immunol. 11: 129-163. Harty, J. T., A. R. Tvinnereim, D. W. White. 2000. CD8+ T cell effector mechanisms in resistance to infection. Annu. Rev. Immunol. 18: 275-308. Wong, P., E. G. Pamer. 2003. CD8 T cell responses to infectious pathogens. Annu. Rev. Immunol. 21: 29-70. Banchereau, J., R. M. Steinman. 1998. Dendritic cells and the control of immunity. Nature 392: 245-252. Steinman, R. M., D. Hawiger, M. C. Nussenzweig. 2003. Tolerogenic dendritic cells. Annu. Rev. Immunol. 21: 685-711. Mellman, I., R. M. Steinman. 2001. Dendritic cells: specialized and regulated antigen processing machines. Cell 106: 255-258. Jung, S., D. Unutmaz, P. Wong, G. Sano, K. De los Santos, T. Sparwasser, S. Wu, S. Vuthoori, K. Ko, F. Zavala, et al 2002. In vivo depletion of CD11c+ dendritic cells abrogates priming of CD8+ T cells by exogenous cell-associated antigens. Immunity 17: 211-220. Guermonprez, P., J. Valladeau, L. Zitvogel, C. Théry, S. Amigorena. 2002. Antigen presentation and T cell stimulation by dendritic cells. Annu. Rev. Immunol. 20: 621-667. Pamer, E. G.. 2004. Immune responses to Listeria monocytogenes. Nat. Rev. Immunol. 4: 812-823. Lara-Tejero, M., E. G. Pamer. 2004. T cell responses to Listeria monocytogenes. Curr. Opin. Microbiol. 7: 45-50. Butz, E., M. J. Bevan. 1998. Dynamics of the CD8+ T cell response during acute LCMV infection. Adv. Exp. Med. Biol. 452: 111-122. Khanolkar, A., M. J. Fuller, A. J. Zajac. 2002. T cell responses to viral infections: lessons from lymphocytic choriomeningitis virus. Immunol. Res. 26: 309-321. Badovinac, V. P., J. T. Harty. 2006. Programming, demarcating, and manipulating CD8+ T-cell memory. Immunol. Rev. 211: 67-80. Jabbari, A., J. T. Harty. 2006. The generation and modulation of antigen-specific memory CD8 T cell responses. J. Leukocyte Biol. 80: 16-23. Lilley, B. N., H. L. Ploegh. 2005. Viral modulation of antigen presentation: manipulation of cellular targets in the ER and beyond. Immunol. Rev. 207: 126-144. Merrell, D. S., S. Falkow. 2004. Frontal and stealth attack strategies in microbial pathogenesis. Nature 430: 250-256. Sansonetti, P. J., J. P. Di Santo. 2007. Debugging how bacteria manipulate the immune response. Immunity 26: 149-161. Hornef, M. W., M. J. Wick, M. Rhen, S. Normark. 2002. Bacterial strategies for overcoming host innate and adaptive immune responses. Nat. Immunol. 3: 1033-1040. Mittrücker, H. W., S. H. Kaufmann. 2000. Immune response to infection with Salmonella typhimurium in mice. J. Leukocyte Biol. 67: 457-463. Luu, R. A., K. Gurnani, R. Dudani, R. Kammara, H. van Faassen, J. C. Sirard, L. Krishnan, S. Sad. 2006. Delayed expansion and contraction of CD8+ T cell response during infection with virulent Salmonella typhimurium. J. Immunol. 177: 1516-1525.
van der Velden, A. W., M. K. Copass, M. N. Starnbach. 2005. Salmonella inhibit T cell proliferation by a direct, contact-dependent immunosuppressive effect. Proc. Natl. Acad. Sci. USA 102: 17769-17774.
van der Velden, A. W., M. M. Velasquez, M. N. Starnbach. 2003. Salmonella rapidly kill dendritic cells via a caspase-1-dependent mechanism. J. Immunol. 171: 6742-6749. Davis, M. M., J. J. Boniface, Z. Reich, D. Lyons, J. Hampl, B. Arden, Y. Chien. 1998. Ligand recognition by αβ T cell receptors. Annu. Rev. Immunol. 16: 523-544. Gorelik, L., R. A. Flavell. 2000. Abrogation of TGFβ signaling in T cells leads to spontaneous T cell differentiation and autoimmune disease. Immunity 12: 171-181. Neild, A. L., S. Shin, C. R. Roy. 2005. Activated macrophages infected with Legionella inhibit T cells by means of MyD88-dependent production of prostaglandins. J. Immunol. 175: 8181-8190. Woolard, M. D., J. E. Wilson, L. L. Hensley, L. A. Jania, T. H. Kawula, J. R. Drake, J. A. Frelinger. 2007. Francisella tularensis-infected macrophages release prostaglandin E2 that blocks T cell proliferation and promotes a Th2-like response. J. Immunol. 178: 2065-2064. Hess, J., C. Ladel, D. Miko, S. H. Kaufmann. 1996. Salmonella typhimurium aroA-infection in gene-targeted immunodeficient mice: major role of CD4+ TCR-αβ cells and IFN-β in bacterial clearance independent of intracellular location. J. Immunol. 156: 3321-3324. Ramarathinam, L., D. W. Niesel, G. R. Klimpel. 1993. Salmonella typhimurium induces IFN-γ production in murine splenocytes: role of natural killer cells and macrophages. J. Immunol. 150: 3973-3974. Pie, S., P. Matsiota-Bernard, P. Truffa-Bachi, C. Nauciel. 1996. γ Interferon and interleukin-10 gene expression in innately susceptible and resistant mice during the early phase of Salmonella typhimurium infection. Infect. Immun. 64: 849-854. Nauciel, C., F. Espinasse-Maes. 1992. Role of γ interferon and tumor necrosis factor α in resistance to Salmonella typhimurium infection. Infect. Immun. 60: 450-454. Schafer, R., T. K. Eisenstein. 1992. Natural killer cells mediate protection induced by a Salmonella aroA mutant. Infect. Immun. 60: 791-797. Kuhns, M. S., M. M. Davis, K. C. Garcia. 2006. Deconstructing the form and function of the TCR/CD3 complex. Immunity 24: 133-139. Liu, H., M. Rhodes, D. L. Wiest, D. A. Vignali. 2000. On the dynamics of TCR:CD3 complex cell surface expression and downmodulation. Immunity 13: 665-675. Alcover, A., B. Alarcon. 2000. Internalization and intracellular fate of TCR-CD3 complexes. Crit. Rev. Immunol. 20: 325-346. Cahill, J., K. E. Hopper. 1984. Immunoregulation by macrophages. III. Prostaglandin E suppresses lymphocyte activation but not macrophage effector function during Salmonella enteritidis infection. Int. J. Immunopharmacol. 6: 9-17. Eisenstein, T. K.. 2001. Implications of Salmonella-induced nitric oxide (NO) for host defense and vaccines: NO, an antimicrobial, antitumor, immunosuppressive and immunoregulatory molecule. Microbes Infect. 3: 1223-1231. Cornelis, G. R.. 2006. The type III secretion injectisome. Nat. Rev. Microbiol. 4: 811-825. Galán, J. E., H. Wolf-Watz. 2006. Protein delivery into eukaryotic cells by type III secretion machines. Nature 444: 567-573. Galán, J. E.. 2001. Salmonella interactions with host cells: type III secretion at work. Annu. Rev. Cell Dev. Biol. 17: 53-86. Galán, J. E.. 1996. Molecular genetic basis of Salmonella entry into host cells. Mol. Microbiol. 20: 263-271. Ochman, H., F. C. Soncini, F. Solomon, E. A. Groisman. 1996. Identification of a pathogenicity island for Salmonella survival in host cells. Proc. Natl. Acad. Sci. USA 93: 7800-7804. Shea, J. E., M. Hensel, C. Gleeson, D. W. Holden. 1996. Identification of a virulence locus encoding a second type III secretion system in Salmonella typhimurium. Proc. Natl. Acad. Sci. USA 93: 2593-2597. Groisman, E. A.. 2001. The pleiotropic two-component regulatory system PhoP-PhoQ. J. Bacteriol. 183: 1835-1842. Wick, M.-J., C. V. Harding, N. J. Twesten, S. J. Normark, J. D. Pfeifer. 1995. The phoP locus influences processing and presentation of Salmonella typhimurium antigens by activated macrophages. Mol. Microbiol. 16: 465-476. Deiwick, J., T. Nikolaus, S. Erdogan, M. Hensel. 1999. Environmental regulation of Salmonella pathogenicity island 2 gene expression. Mol. Microbiol. 31: 1759-1773. Hoertt, B. E., J. Ou, D. J. Kopecko, L. S. Baron, R. L. Warren. 1989. Novel virulence properties of the Salmonella typhimurium virulence-associated plasmid: immune suppression and stimulation of splenomegaly. Plasmid 21: 48-58. Matsui, K., K. Nagano, T. Arai, I. Hirono, T. Aoki. 1998. DNA sequencing of the gene encoding Salmonella typhimurium-derived T-cell inhibitor (STI) and characterization of the gene product, cloned STI. FEMS Immunol. Med. Microbiol. 22: 341-349. Foster, T. J.. 2005. Immune evasion by staphylococci. Nat. Rev. Microbiol. 3: 948-958. Yao, T., J. Mecsas, J. I. Healy, S. Falkow, Y. Chien. 1999. Suppression of T and B lymphocyte activation by a Yersinia pseudotuberculosis virulence factor yopH. J. Exp. Med. 190: 1343-1350. Rosqvist, R., I. Bolin, H. Wolf-Watz. 1988. Inhibition of phagocytosis in Yersinia pseudotuberculosis: a virulence plasmid-encoded ability involving the Yop2b protein. Infect. Immun. 56: 2139-2143. Black, D. S., J. B. Bliska. 2000. The RhoGAP activity of the Yersinia pseudotuberculosis cytotoxin YopE is required for antiphagocytic function and virulence. Mol. Microbiol. 37: 515-527. Fällman, M., K. Andersson, S. Håkansson, K. E. Magnusson, O. Stendahl, H. Wolf-Watz. 1995. Yersinia pseudotuberculosis inhibits Fc receptor-mediated phagocytosis in J774 cells. Infect. Immun. 63: 3117-3124. Fink, S. L., B. T. Cookson. 2007. Pyroptosis and host cell death responses during Salmonella infection. Cell. Microbiol. 11: 2562-2570. Mariathasan, S., D. M. Monack. 2007. Inflammasome adaptors and sensors: intracellular regulators of infection and inflammation. Nat. Rev. Immunol. 7: 31-40. Zhang, Y., J. B. Bliska. 2005. Role of macrophage apoptosis in the pathogenesis of Yersinia. Curr. Top. Microbiol. Immunol. 289: 151-173. Fields, P. I., R. V. Swanson, C. G. Haidaris, F. Heffron. 1986. Mutants of Salmonella typhimurium that cannot survive within the macrophage are avirulent. Proc. Natl. Acad. Sci. USA 83: 5189-5193. Rous, P., F. S. Jones. 1916. The protection of pathogenic microorgaisms by living tissue cells. J. Exp. Med. 23: 601-612. Dustin, M. L., S. Y. Tseng, R. Varma, G. Campi. 2006. T cell-dendritic cell immunological synapses. Curr. Opin. Immunol. 18: 512-516.